Rolls-Royce has shown the Celestial Phantom for the first time at Frankfurt. 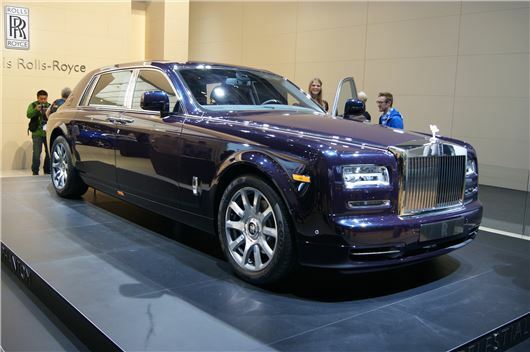 It's a one-off long-wheelbase version built to celebrate 10 years of Phantom production, and comes with special paint scheme and interior theme. The paint is treated with fine glass particles for additional lustre, and inside there's a new version of the Starlight Headliner, which feature constellations, exactly as they were at midnight on that historic evening are represented by over a thousand fibre optic lights hand-woven into the Celestial Phantom’s headlining. The night-sky constellation arrangement was verified by the South Downs Planetarium to ensure authenticity. Other features include bespoke glassware and a picnic set, while the wheels are a new design. Elements of the Celestial could be offered as part of Rolls-Royce's personalisation programme, and the Rolls-Royce Celestial Phantom is mechanically unchanged from the standard car. It could make production if there's enough demand.